And yes, the white lettres went out because obviously. Okay so they’re not totally unnecessary. One of the highways locally requires the severe-snow-mountain-peak-snowflake-whatever tires, and the old ones weren’t. And if I hadn’t already been a believer in the winter-rated tire, I would be now. 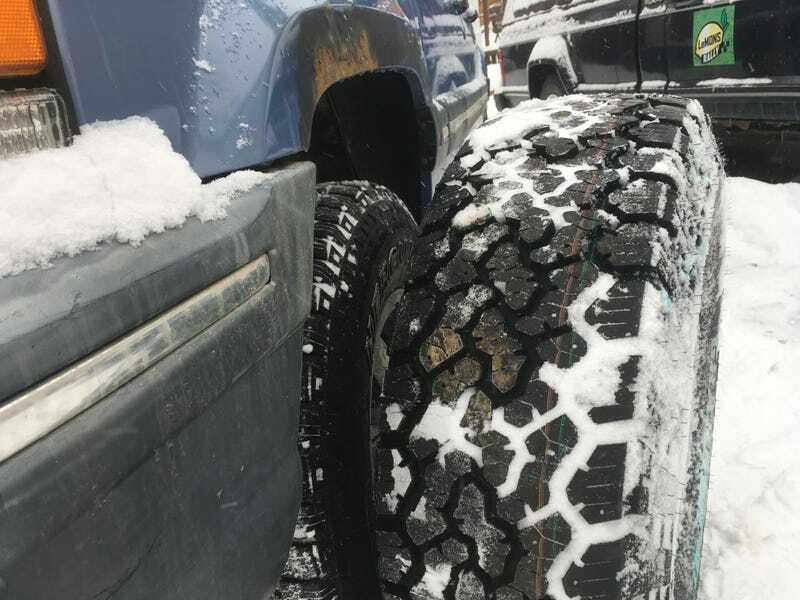 Traction wasn’t necessarily bad before, but in 2wd now it’s about what it was in 4x4. These also far exceed what I got out of the KO2s on my Jimmy, which were frankly a joke in the snow. With the TrueTrac sitting on my shelf waiting to go in, this will make for a pretty unstoppable daily driver. The ride is a little firmer now, and even in the snow I can tell acceleration has dropped somewhat, although the lengthening of gears has meant first is a little more useful on the street now than it was before, although my mpg likely will tank. But also they seem to have corrected my speedometer error. So there’s that.